Tina's Crop Shop: ICS Blog Hop - Fabulous Framelits! Hello and Welcome to Inspire, Create, & Share's Fabulous Framelits Blog Hop! If you have already been hopping you should have landed here from Deb Naylor's fabulous blog and I'd like to thank you for continuing on the hop! Stampin' Up! has so many fabulous stamp sets with matching framelits that I have to admit this was a tough decision! I mean really how do you choose with so many great sets! Well my decision was really down to which set I hadn't had time to play around with! lol So Weather Together and the coordinating Umbrella Weather Framelits Dies was the winner! I started with an 5 1/2 x 8 1/2" piece of Dapper Denim Cardstock that was scored at 4 1/4". My next layer was a 5 1/4" x 4" piece of Whisper White Cardstock. My top layer was a 5" x 3 3/4" piece of Soft Sky Cardstock that was sponged along the edges as well as some random circular motions with Dapper Denim Ink. I added three clouds cut from the framelits in Basic Gray and then sponged along the edges with Dapper Denim. The small one was attached with Snail adhesive and the large clouds were attached with Dimensionals. I also cut out some of the rain drops from the framelits in soft sky and attached them with a Fine Tip Glue Pen. I also layered some of the glue onto the top of the rain drops to give them some dimension. I stamped my umbrella handle with Dapper Denim onto Basic Gray cardstock and cut them out with the Framelits as well. 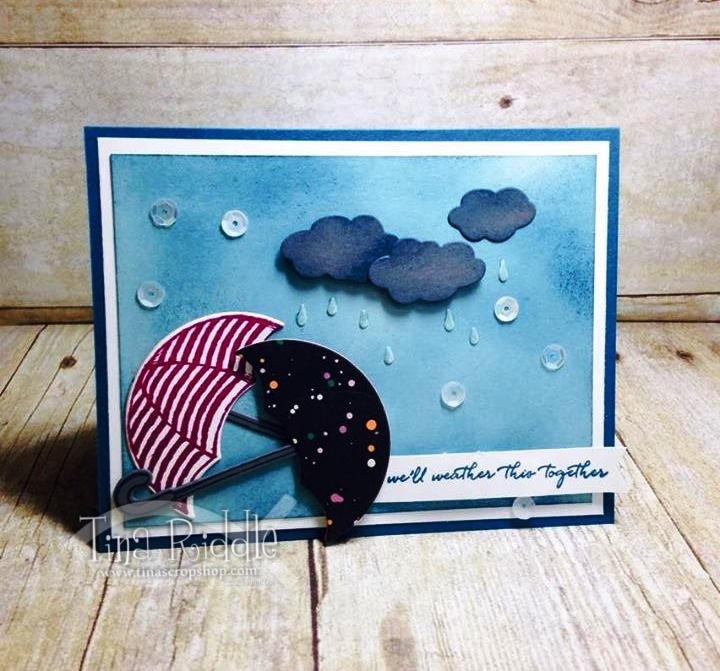 The bottom umbrella was stamped onto Whisper White cardstock with Rich Razzleberry Ink and the top umbrella was simply cut with a piece of Playful Palette DSP. I stamped the "we'll weather this together" sentiment from the Weather Together stamp set with Dapper Denim Ink onto a 1/2" strip of Whisper White Cardstock. I used my Paper Snips to cut a banner end on the right side of the sentiment and tucked the left side under one of the umbrellas. Lastly I used my Fine Tip Glue Pen to add a few sequins. This was such a simple yet fun card to make. If you don't have this set yet, why don't you? It's fabulous! Next up is the awesome Joni Metras, just click the next button and you'll be there! Since this fit the challenge I added my card to the SUO Challenge Blog!